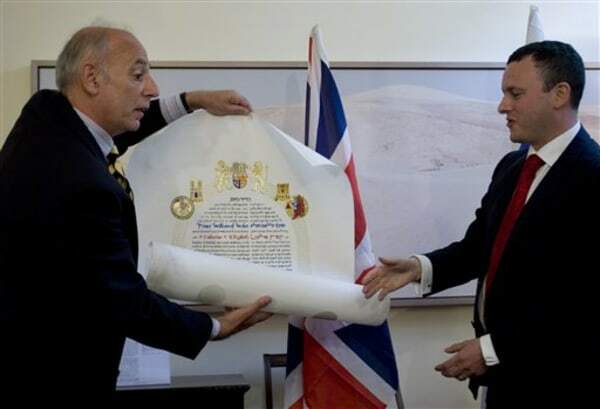 Artist Mike Horton presents a scroll written in the style of a Ketubah, a traditional Jewish wedding scroll, he made for Britain's Prince William and fiance Kate Middleton's upcoming royal wedding, to Britain's Ambassador to Israel Matthew Gould, in Ramat Gan, Israel. Britain's newest royal couple is receiving an unusual wedding gift: A Jewish-style marriage contract. Michael Horton, a British-born Israeli, designed the intricately illustrated Ketubah, or wedding contract, for Prince William and Kate Middleton, who wedding is set for April 29. The custom-made contract in Hebrew and English combines traditional language with egalitarian themes, without religious references. The scroll reads, "May we remain committed to each other's physical and mental well-being, and to each other's emotional and spiritual growth." British Ambassador Matthew Gould pledged Thursday to deliver it to the couple, calling it "an extremely appropriate and lovely gift." The traditional Ketubah stipulates the responsibilities of the groom to the bride and protects her if the union ends. Is Kate changing her shopping ways?